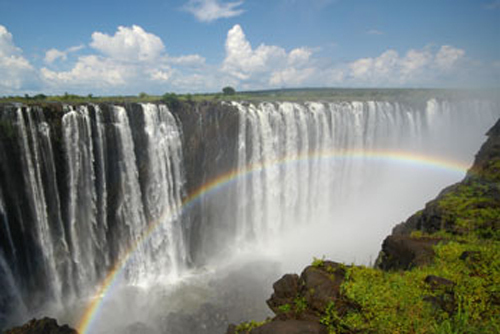 Victoria Falls is undeniably a photographer’s paradise. Every which way you look your eyes feast on the breathtaking scenery. The problem is that our eyes take in the whole spectacle with ease, but to capture this immense panorama on camera is not an easy challenge. Scroll through a few of my pictures below. These are available in high definition if anybody wants at a small cost. Please contact us. 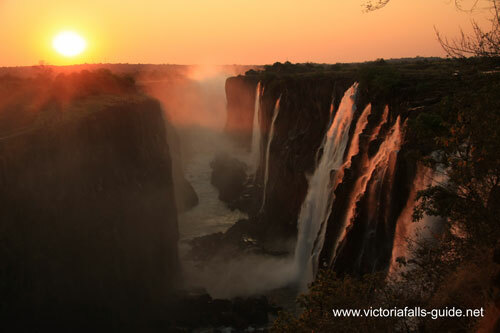 Victoria falls pictures 1 - Sunrise at Victoria Falls. 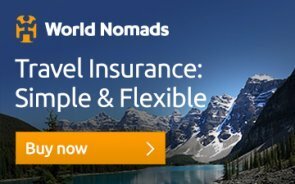 In my view this is an absolute must do. The park entrance gate opens at 6am giving you just enough time to get in and set up before the sun peeps over the horizon. This shot was taken at 6.18am in late September when the sun very conveniently rises behind the main falls creating this absolutely magical scene. 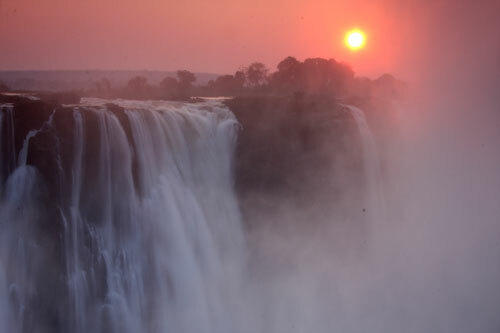 Victoria falls pictures 3 - As the sun continues to rise, hues change from red to pink, it's so beautiful. How convenient to have some palm trees placed just perfectly to add to the scene as well. A tripod is an essential piece of equipment to get the silky effect of the water at slow shutter speeds. 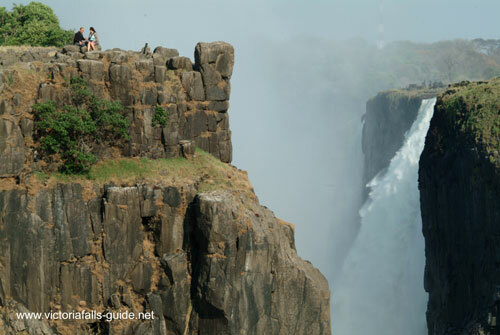 Victoria falls pictures 4 - From viewpoint 1, by David Livingstone's statue you get to look over Devils cataract and down the length of the Falls. 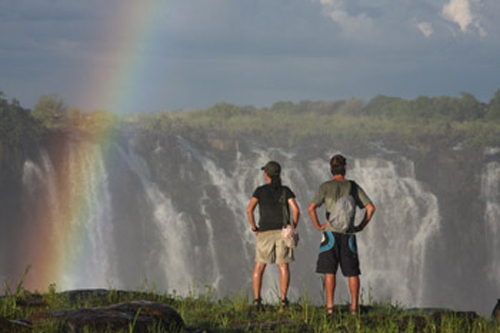 Rainbows like this are seen at around about 2pm (variable with the time of year) when the sun is behind you. 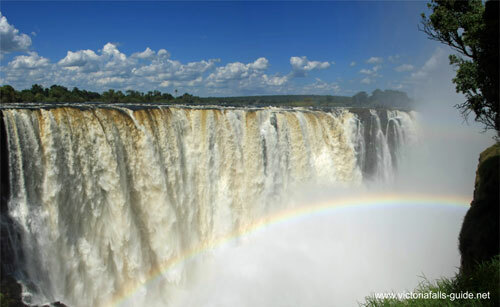 Victoria falls pictures 6 - The previous Photo was of the Falls from the Zimbabwe bank this photo is taken from the Zambian bank looking towards Zimbabwe. 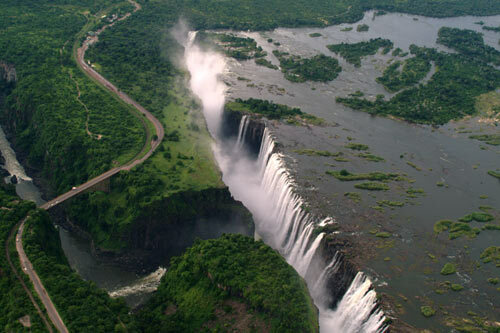 The narrow gap separating the two countries is clearly visible as the mighty Zambezi transforms from a 1.8km wide lazy river to a turbulent and angry narrow gorge . The Bridge and border separating the countries is also visible. 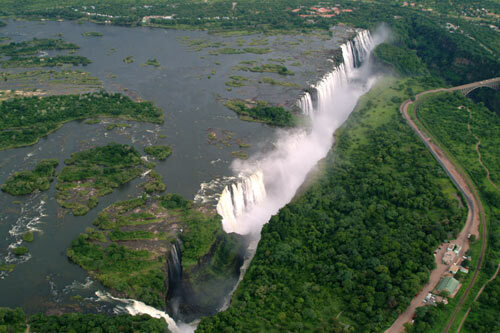 As you can see the Majority of the Falls is best viewed from Zimbabwe, with Zambia only having the Eastern Cataract in the very bottom of the photo. 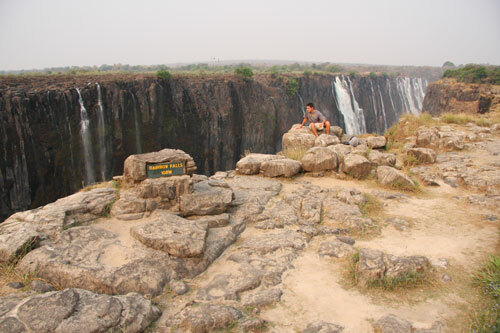 Victoria falls pictures 7 - This is taken at what is called Danger point, it's the furthest point that you can go on the Zimbabwe side and it looks across to the Zambian side, and also down into what is known as the boiling pot. 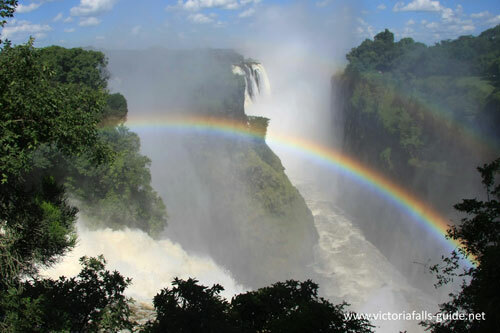 Victoria falls pictures 8 - Rainbows are best seen in the afternoon from 2 pm onwards as in this photograph - which is taken at what is aptly named rainbow falls. 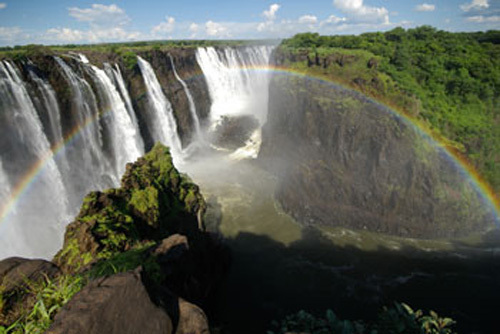 The next photo shows this section of the falls in the dry season. 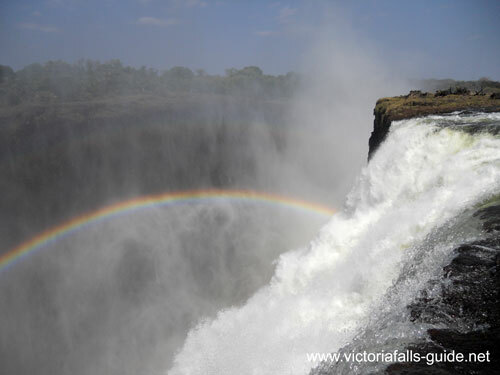 Victoria falls pictures 9 - This is the same section of falls as the previous photograph ( Rainbow falls) but this is taken in October when the water levels are lower, as you can see they are completely different. Eastern cataract in the background still has some water but this will even dry up at the height of the dry season - mid to end November. 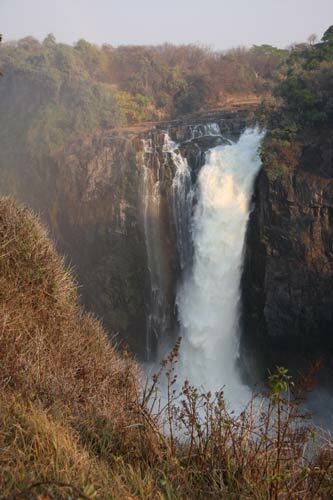 Victoria falls pictures 10 - Even in the Dry season this section of the Falls - Main Falls still has plenty of water pounding over the lip. This shot is taken looking through the dense vegetation of the Rainforest. 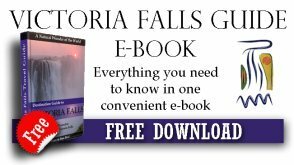 Vfp 11 - Devils cataract is the lowest and smallest of the Falls to the extreme west of main falls. 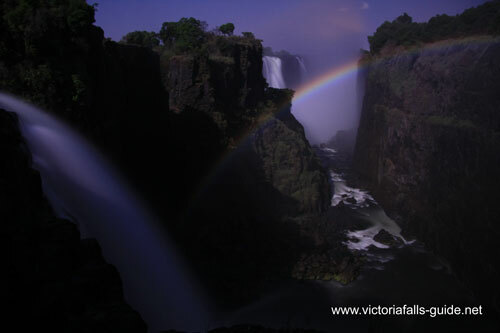 This shot is taken in the early morning with the rainbow just beginning to form, morning is the best time to get the light falling on these Falls. 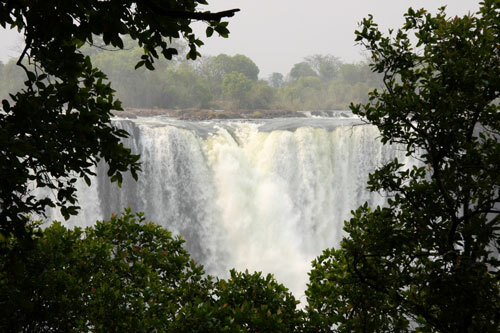 The statue of David Livingstone who first saw the Victoria Falls in 1855 sits amongst the trees just above these falls. 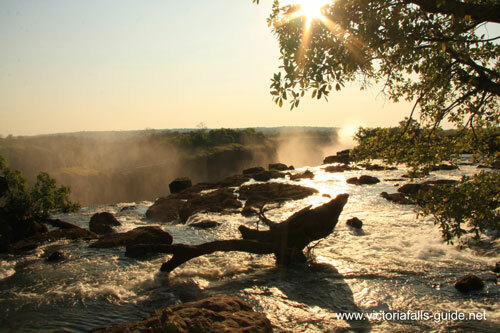 Vfp 12 - This Photo is taken from Danger point in late afternoon as the sun is beginning to set, it looks back along the length of the falls towards the main falls. My photo's just can't capture the awesome height and power of the water as it surges in the gorge below. 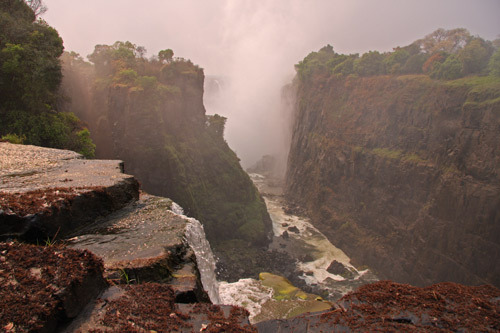 Victoria falls pictures 14 - Between viewpoints one and two you can descend and set of slippery steps to get a lower view of the Falls... it's a bit like climbing down into the gorge and it looks right down the length of the Falls. 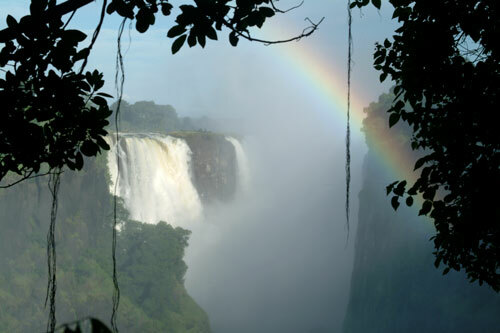 The rising spray obliterates much of the view but you can see the first bit of the main falls and wonderful rainbows are visible on sunny afternoons. 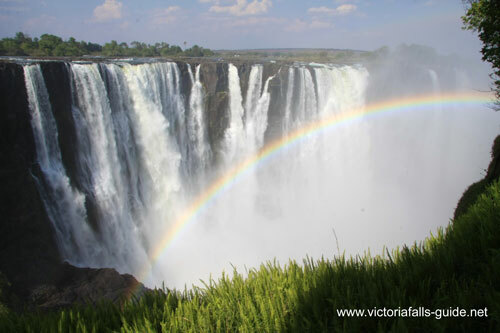 Vfp 15 - Some places you can stand right on the edge of the falls, it is difficult to describe just how awe inspiring this experience is. 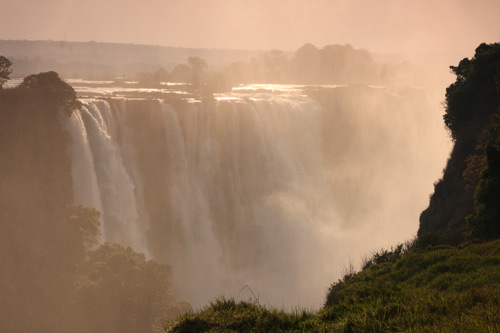 Vfp 16 - This shot is taken from the rocks below Viewpoint number one by Livingstone's statue, and gives and angle not normally seen. Vfp 17 - Main Falls in October, this shot is taken using a long mono pod holding the camera high and out over the barriers, capturing the raging river below . Like all shots of main Falls it's quite a challenge to get this photo before the lens becomes saturated with spray from the rising spray. 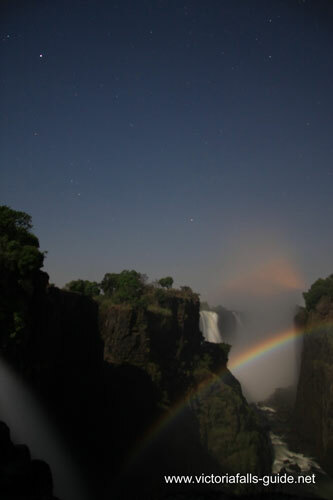 Vfp 23 - The above 3 photographs are all taken at about 3am of the lunar rainbow. That's right they are taken at night with just the light from the full moon. To the naked eye the moonbows although you can see them don't stand out that clearly and certainly don't have much colour, but the camera mounted on a tripod with an exposure time of 30 seconds, reproduces them beautifully, almost looks like daytime! 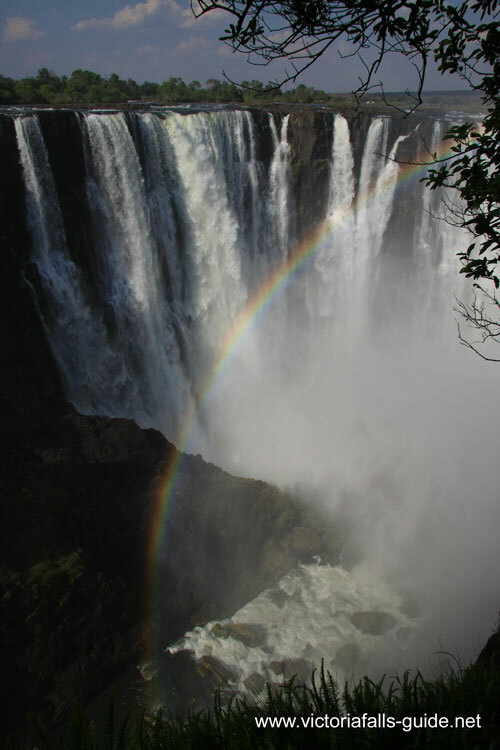 Vfp 24 - This photo is taken on the Zambian side in late afternoon. 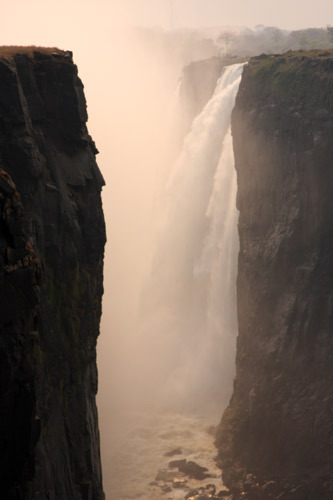 The viewpoint allows you to get very close to the river just above the precipice where the water plunges over the edge. 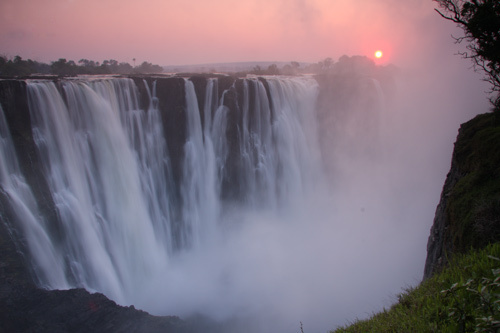 Vfp 25 - This photo is also taken from the Zambian side at sunset in October. 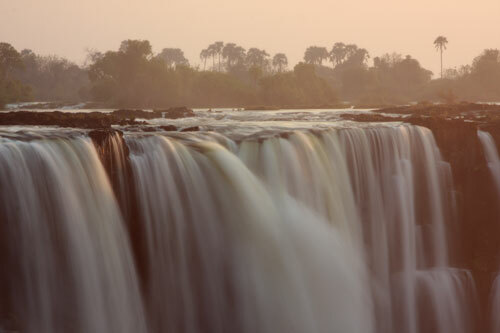 It is not possible to get a shot of the Falls like this at sunset from the Zimbabwe side the angles just don't allow it. The entrance/exit gate closes at 6 pm but this vantage point is very close to the gate so you can wait for that great sunset shot and then quickly run out, hopefully the guy on the gate wont mind you being just a few minutes late. 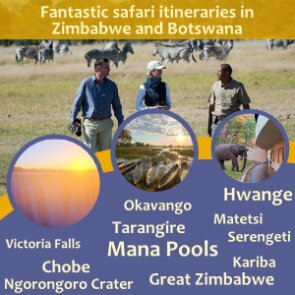 Vfp 26 - These people are sitting at danger point on the Zimbabwe side, this is taken from the Zambian side looking back at them. 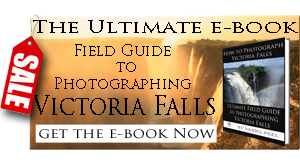 If you would like to read about more about Taking Photographs at Victoria Falls please have a look at this page on our website.